4 different lenghts of Lollitsticks. Perfect for your lollies, cake pops, chocolate work as well as dowels for lighter weight cakes. Perfect for decorating your cupcakes for Easter! 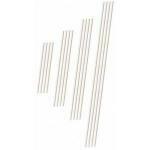 Lollipop Sticks 25 in a pack, 20cm/7.9"
Lollipop Sticks 50 in a pack, 11.5cm/4.5"
Lollipop Sticks 75 in a pack, 9.5cm/3.7"